I went to the bank last week, and I had my computer Joe slung over my shoulder just in case I needed something. It turned out to be a good thing because I was missing some account info. While I was looking it up I could see my banker was watching with quite a bit of curiosity. Finally she said "Wow, that’s pretty cool, I’ve never seen an iPad before." Now Joe is a lot of things, but he’s definitely not an iPad. Just for starters, he’s a 3 pound ruggedized brick, built for construction sites. He’s all Windows. He might be portable, as real computers go, but still he’s full-size. My banker is a smart person. 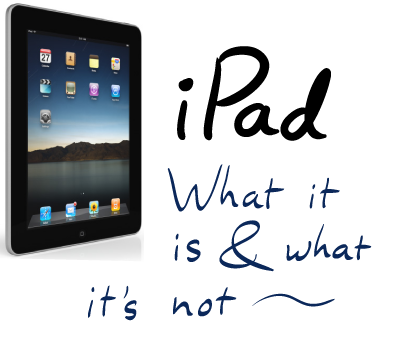 It’s just that for many people the iPad is the first slate they’ve run across.